A little while back, I discovered a prototype game called “Project Space” that looked to be a mix of Freelancer and Elite, at least according to that awesome YouTube video anyway. I therefore took it upon myself to contact the folks at the company behind it, Sidhe, to find out more about this sadly canceled game that might again see the light of day if there’s enough interest. Managing Director Mario Wynands got back to me, and was open to doing a Q&A. You can read the results after the cut. Enjoy! Brian: Could you tell us the story behind inspiration for and creation of “Project Space”, as well as when work began on the project? Mario: The original concept to do a modern version of Elite has actually been kicking around the studio for a very long time, perhaps about 7 or 8 years or so. “Project Space” was originally envisaged as a PlayStation Portable title, back when that was one of the platforms we were developing for and for which we created another original IP, GripShift. We kicked the tires on that with Sony and publishers but were told several times over the years that there were already other similar projects on the works, and were advised against proceeding. However, we never saw any of these supposed projects come to fruition, so some years on we decided to move forward anyway with a view to bringing it to PC and console download and started development in 2010. Brian: How much of the game was completed before funding ran out, and which features were already implemented when it was shelved? Mario: We were still in the very early stages of development, in pre production. We’d mapped out the core functionality and were building out the design, explored visual style, written a lot of the fiction, and experimented with various gameplay and procedural elements via prototyping. The basic foundation was there on which to move forward, but not a cohesive game as yet. Brian: You mention the game is inspired by Elite, but it also seems to be reminiscent of Freelancer as well, at least in terms of the controls. Could you elaborate as to which elements of games like these inspired you and found their way into “Project Space”? Mario: The game shares elements from the likes of Elite, Freelancer, and other titles in the genre, but the core concept was to reboot and modernize Elite with current gaming paradigms, functionality and presentation. In essence, we loved the premise (and promise) of Elite, and members of the dev team have lost many hours to the open world possibilities of that game, creating their own adventure in a universe big enough it could never be explored by a single individual. We see an opportunity to develop a richer yet more accessible experience by employing techniques such as more sophisticated procedural technology, robust and varied AI, modular crafted content, relatable creative, context sensitive controls, and social connectivity. Brian: Could you tell us something about the universe the game takes place in, such as size, races and so on? Mario: The game takes place in a galaxy far removed from the Milky Way called The Cluster, with a group of displaced humans who are strangers amongst established native races. Humans are considered a novelty, but also bring with them unique technology which helps them carve out their own place in this new frontier with an exclusive mastery over a specific aspect of spacetime. Although the Cluster is mostly stable and at peace, there are fringe elements and outside powers that threaten the status quo. Conflict and war are commonplace along the borders between the hundreds of controlled and uncontrolled solar systems. But where there is conflict, there is opportunity for a brave adventurer with a well equipped ship. Brian: What kind of control scheme would be looking at for “Project Space”? It looks mostly mouse-based, like in Freelancer or SOL: Exodus, for example. Mario: The prototype video actually depicts control with a console gamepad in a free roaming 3D environment. In this particular instance, controls were based around primarily using a single stick in a context sensitive fashion which makes for very precise flight and maneuvering. Our expectation is that such a control paradigm could transfer easily to mouse and keyboard or even touch. Though again we were early in development so there was much to still test and tune. Brian: Your description of the game includes the phrase “heavy customization”. Is this regarding ship customization (i.e. ships, weapons, equipment) or overall game customization (i.e. difficulty level, mod support, etc), and could you elaborate on this customization as a whole? Mario: Our games have often included the ability for the gamer to heavily customize their play experience, and tune it to how they want to play. That has included opening up our titles for easy modding (on PC at least). We’d again be looking to provide the gamer great flexibility via wide-ranging in-game choice, and broad game software level options, and would consider the potential for modding. Brian: Your description also includes “expansive procedural content”. Would you please elaborate on this as well? Does this mean different types of missions and campaigns, for example? Mario: The game would have included both crafted and procedural content across solar system and planetary system makeup, stations and ships, equipment, missions, and encounters etc. Brian: Could you also please elaborate on the Spore-like “social cross pollination” of content as mentioned in your game’s description, please? Mario: Spore helped create rich and interesting content for all players by seamlessly seeding custom content from one gamer into the game worlds of others, even without direct interaction. We’d designed a system for facilitating similar functionality and custom content sharing in “Project Space”. Brian: Returning to funding for a moment, your teaser video mentions beginning a Kickstarter campaign in order to get the funding needed for the project. Could you give a rough estimate as to how much you would need to resume development, and how long it would take to be released? Mario: We’ve recently been looking at Kickstarter as a possible avenue for funding this or other projects. At this stage, it is certainly not a given that we will bring “Project Space” to Kickstarter at all, but the response we have had to releasing the video has been encouraging enough to give it careful consideration. The budget for the original vision was over US$2m. But, even accounting for the funding we’d be able to bring to the table internally, that amount seems overly ambitious for a Kickstarter campaign. Chances are we’d look to do something scaled down, with a view to releasing a game we could build on and expand over time. I’d say the amount we would probably target on Kickstarter would be around the $500k level to achieve that, but we’d outline our plans if we were to exceed that level of funding all the way up to the $2m mark. 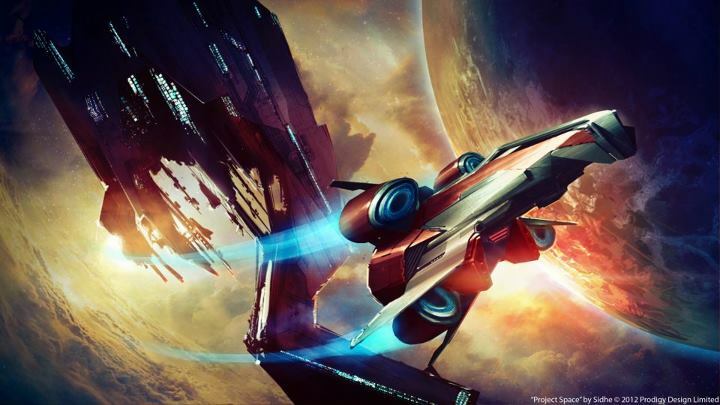 Brian: Finally, if you were interesting in beginning a Kickstarter campaign, what would you say to space game fans and potential customers of your game to get them interested in investing in you and your game? Mario: There remain many unanswered questions around the project, so we are yet to establish whether we’ll forward and on what basis. Because of that we are yet to put together a succinct pitch to help hook people. Needless to say, if we proceed, we would hope to present a compelling package to fans that showed that with our existing experience, technology and talent, combined with their help that we have the opportunity to bring a great game to the table in a sadly underrepresented genre. A big thanks to Mario for taking the time to answer those questions. If you liked the concept shot used at the top of the article, Sidhe had released more on their Facebook page. I’ll be keeping an eye on this one, and will let you know if there are further development. Thanks for reading!